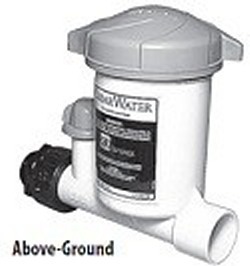 Above ground pool inline Chlorinator. Many other uses, including misting systems and anything you want to keep algae free. Also works great as an inline fertilizer. Just add liquid fertilizer (worm castings, compost tea, etc) to the reservoir and set the dial to adjust how much goes into the stream. Can also be used with any fertilizer that can be dissolved into a liquid. Ends are 1.5" sch 40 slip socket, so you may have to reduce down to whatever size your system is. Has an adjustable dial to set the dosage.